Do you ever look at your yard and think it needs a little something to help it stand out in the neighborhood? Wish your properties beautiful details didn’t disappear after sundown? Then perhaps you should consider low voltage LED landscape lighting. This sort of outdoor lighting will turn your domain into a warm and inviting space irrespective of the sun. Lighthouse Outdoor Lighting of Northern NJ is a company staffed by award winning and certified low voltage lighting designers and technicians, with formal accreditation from the Association of Outdoor Lighting Professionals. Acquiring AOLP certification is no easy milestone and all but guarantees we provide excellent outdoor lighting designs. Armed with knowledge, training, and experience, we create landscape lighting designs that not only bring to life the very best features of your home but minimize features that can appear less flattering during the day. Resident and guest safety is an essential component in every Lighthouse outdoor lighting design. With the use of light, our designers help you and those welcome safely navigate your outdoor living spaces while eliminating potential hiding spots for would-be trouble makers or intruders. Lighthouse Outdoor Lighting of Northern NJ is the best-rated landscape lighting design firm in the state. At Lighthouse, we are the leader in the landscape lighting industry. Lighthouse Outdoor Lighting is a national brand with locations scattered across the USA. Our sister company, Nightscaping® invented the low voltage landscape lighting business over 58 years ago under the leadership of its founder Bill Locklin. Today Nightscaping along with our other sister companies lead the way in manufacturing the finest landscape lighting products right here in the USA. As the industries most experienced organization we are familiar with all the aspects of low voltage and LED bulbs; including color temperature, lumen output, voltage drop and other tricks of the trade that will guarantee you are pleased with your outdoor lighting design. 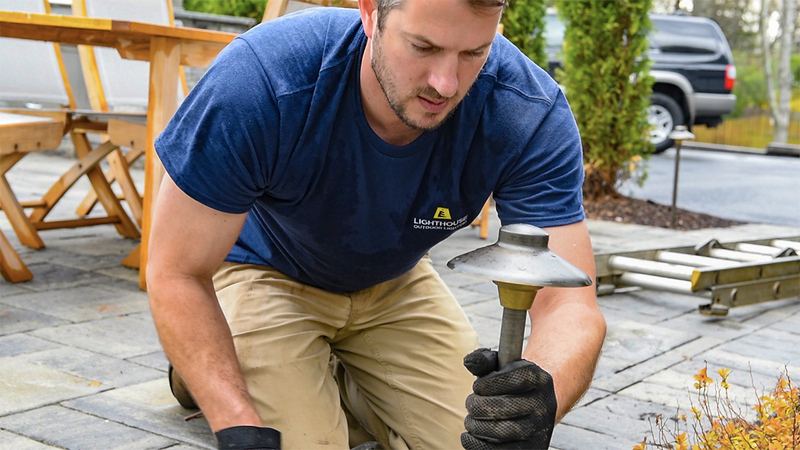 The Lighthouse comprehensive warranty and maintenance program is second to none and intended to keep your landscape lighting system up and running as smoothly on year ten as it did on day one.